Weekly Urban Update: A tale of big cities. Cities are making their way to the top. What happens to everyone else? Beijing is keen on shaking off their smoggy reputation, and their performance in the end of 2017 shows they're making great progress. According to a new report from Greenpeace, the levels of toxic PM2.5 (atmospheric particulate matter so small that they can only be detected with an electron microscope) in and around Beijing has gone down by a whopping 33% in just the last three months of 2017, largely due to a sixth-month climate action plan that was put into place in October. But while Beijing and the 26 surrounding cities celebrated their climate victories, the rest of China did not measure up. Despite a national air pollution action plan that has been marginally successful since its implementation in 2013, a renewed national focus on industry has caused PM2.5, NO2 (a fossil-fuel burning indicator) and ozone pollution levels to go up in much of the rest of the country, alarming statistics for a country where pollution has been blamed for thousands of premature deaths nationwide. As Beijing is another city taking the lead on climate action, understanding the reasons for its progress could provide important lessons for other Chinese cities as well as cities elsewhere. A look inside Berlin, the divided arrival city. As IHC Global has previously chronicled, Berlin has been a changed city since the refugee crisis knocked on its door over three years ago, and with new waves of migrants arriving from everywhere and anywhere (most recently, Romania and Bulgaria), it is continuing to reshape itself around the immigrants and refugees that now call it home. Many Berliners are striving to make their city as inclusive and welcoming as it can be, but in an increasingly divided political climate, this task has proven to be difficult. Yet local actions from both organizations and residents have done wonders for integrating newcomers. Refugee-oriented community centers have popped up throughout the city; local organizations host events, activities and classes that help get refugees situated, such as German language lessons; and throughout it all, refugees, natives and expats alike have formed strong bonds that are representative of what the new Berlin actually looks like. Citylab dives into the personal stories of the people trying to make Berlin a home for everyone, from individual refugees to volunteers to organization leaders. Another year, another argument about transportation fares. The London transportation fare has gone up for the new year, and with the increase returns an age old argument: that hiking up fares is actually a "progressive" move. The argument goes like this: because the majority of transit takers are high earners, they should be paying the brunt of the costs instead of leaving it to be settled out in taxes, where lower-income taxpayers that do not take the trains as much will be unfairly charged. But this argument has several holes in its tapestry, and neglects all of the lower-income people for whom taking the train is not a choice, but a necessity. Revisiting this issue, CityMetric makes the case for investing in urban transportation, and counters the exhaustive arguments against it. Over the last 30 years, major U.S. cities like New York and San Francisco have become economic powerhouses shaped by increasing globalization, computerization, and a shift from the manufacturing to the knowledge economy. According to a recent New York Times article, this has forever changed how they interact with each other, and with the towns next door. As these cities have become centers of technological innovation and their populations have shifted to include more high-skilled workers, they have come to depend less and less on manufacturing and production from the smaller cities, towns, and rural areas that surround them, and more and more on other high-skilled workers in megacities across the globe. As Temple University Professor Ram Mudambi puts it, "The more globally connected a city, the more prosperous it is. And as such cities gain global ties, they may be shedding local ones to the "hinterland" communities that have lost their roles in the modern economy or lost their jobs to other countries." To put it another way, the "knowledge work" has overwhelmingly moved to cities, while the "routine work" that had normally been done in these hinterlands has predominantly moved overseas, disrupting the long-established value chains between cities and hinterlands. If cities are only going to continue to along this route, what can be done? Does Chicago have the fastest-improving urban educational system in the U.S.? It's debatable. It's no surprise to us: urban farming may be key to fighting hunger and climate change. Make 2018 the year of fun maps! Commute times to cities across the world have been mapped out in some beautiful- and worrying- visual breakdowns. Trees please! In some crazy ambitious projects, millions of trees will be planted across the U.K. and China. Registration for the World Urban Forum closes on January 15th. Learn more about the World Urban Forum here. 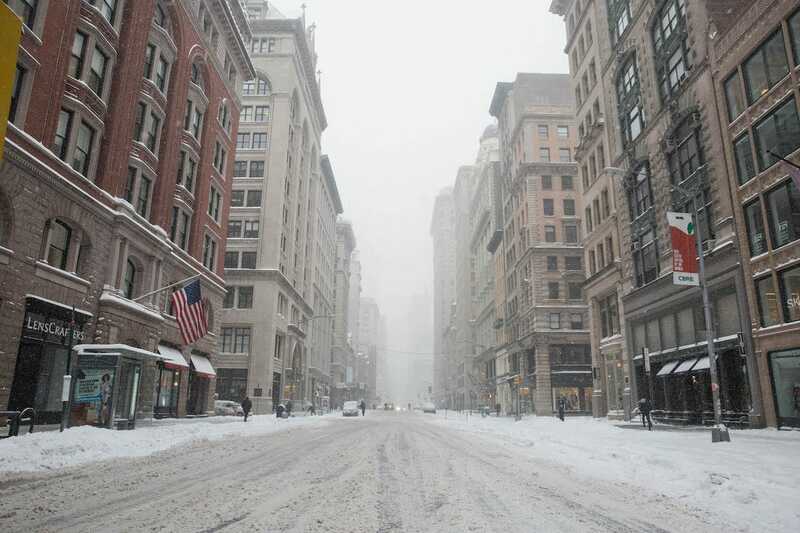 An empty, snowy New York City street, in the midst of the "bomb cyclone" winter storm that touched down on the U.S. East Coast earlier this week.